These butter prawns were so creamy and delicious. Mind you, it's very addictively delicious. One of the good things that I love about food blogging is receiving feedback from my readers’ email. Through all the email exchanges, I shared their joy and satisfaction after trying my recipes. Thank you all for your encouraging feedback. Amongst all the encouraging feedback, here’s a unique one from Eric Tan, a reader in Malaysia, that’s a wonderful recipe I didn’t ask for. 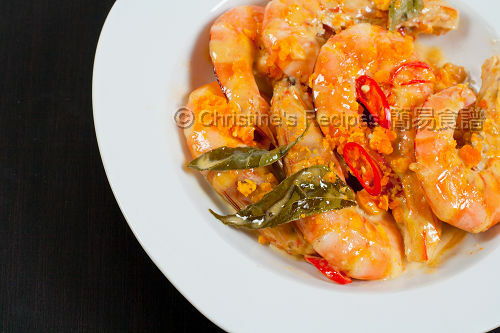 When I saw this popular Malaysian recipe, Butter Prawns, fine-tuned by himself appearing in my inbox, I said to myself that was a must to try. Yet, without any reason, it took me quite a long time to try it out. Finally, I’m glad I did. It’s a fantastic dish. Thank you, Eric. The butter prawns were so creamy and delicious. Although Eric made a remark that the curry leaves are optional, I strongly recommend to use them, that often used in Malaysian and Indian cuisine, because you’ll find the little leaves add extra aroma and enrich the taste of the dish. Eric’s recipe calls for salted egg yolks. Excellent, I still had some homemade salted eggs in the fridge. By stirring in the mashed salted egg yolks, not only did the whole dish was brightened up, but also created more depth in the savoury taste. Trim prawns and devein. Rinse thoroughly and pat dry. Set aside. Heat oil and deep fry prawns until 80% done. Drain out on kitchen papers to absorb excess oil. Set aside. Heat 2 tablespoons of butter over low heat until melted. Add curry leaves, chillies (if you want to use), stir-fry for 2 minutes until aromatic. Add evaporated milk, sugar, chicken powder. Season with salt. Continue to cook over medium heat until sauce thickens. Toss prawns back to the wok, and stir constantly. Increase heat to high and cook until sauce dries up. Sprinkle salted egg yolks. Stir to combine. Serve hot. Christine, I would for sure take your advice in using the curry leaves as I have always adored the use of them in Malaysian cuisine. Very nice dish indeed, thanks for sharing lady and gentleman : ). The curry leaves will make a difference in taste, definitely. When I made Cereal Prawns some time ago, I did it without curry leaves (cos they are hard to get in the US) and the results are not as good as those I have had with curry leaves. It is the aroma with butter! Your addition of salted egg to Butter Prawns is the magical touch too. I love your yummy-looking butter prawns. The curry leaves are a must as they give the dish its distinctive flavour! Great clicks and such vibrant colours. Yes, curry leaves will enhance the look as well as the aroma and your addition of slated egg adds zing to it! Thumbs up! looks delicious and I bet my husband will love this, and with the added salted egg, yummy! I love this dish too. Next time you may wish to add some green bird eye chilli for that extra aroma. They should be left whole. You can omit the red chilli then, but never the curry leaves. The name of the dish had me liking it already, and the recipe and photo sealed the deal! Love butter prawns being Malaysian! I have to tell u that I took such a long time to find curry leaves in San Diego!! gorgy photos! 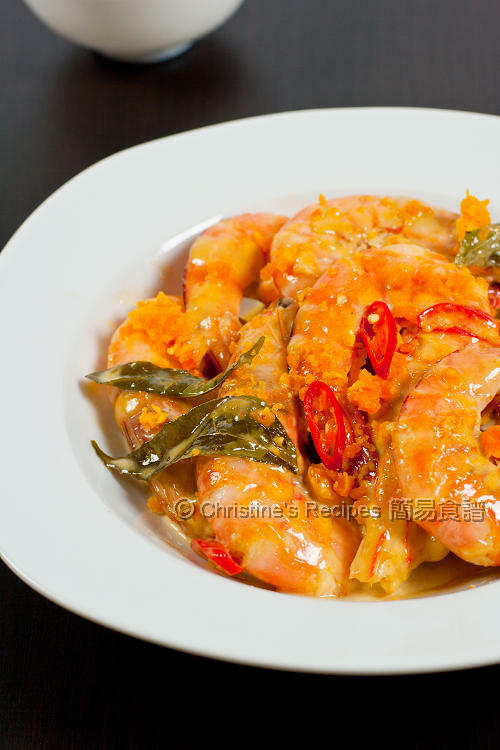 Christine, the prawns look so tasty, such a vibrant color...love the salted egg yolks in it...YUMMIE! Love this dish! I usually have butter crabs, and with mantou. YUM! great recipe! looks so creamy and yes, curry leaves are a must in this dish! Have tried it out and it was really good. My niece and friends love it. can't wait to see more new recipes from you. Dear Christine, how big is the tin of evaporated milk you use? Please advise. I used a small can.